mmsonline.com March 2017 MMS 117 TOOLING AND WORKHOLDING drives the workpiece into the fixed V locator. An insert enables the flat on the moving jaw to rotate into perfect alignment and full contact with the matching flats of the tool. Standard models include through-hole, high-speed and quick-change. Chucks are available in inch or metric sizes rang- ing from 3" to 18" (76 to 457 mm). Accuracies of 0.001" to 0.00001" (0.254 mm) are guaranteed, the company says. 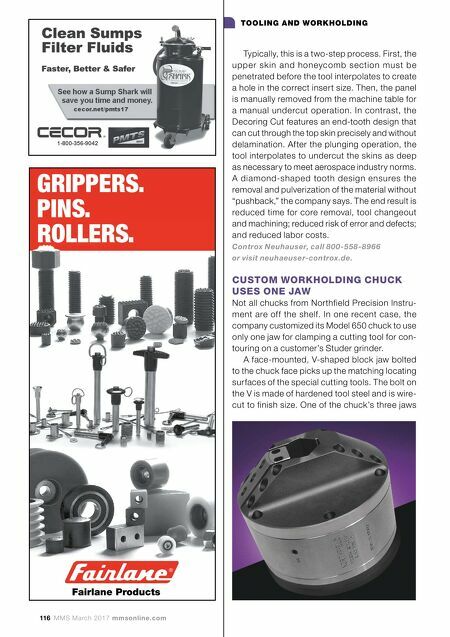 Northfield Precision Instrument Corp., call 800-810-2482 or visit northfield.com. 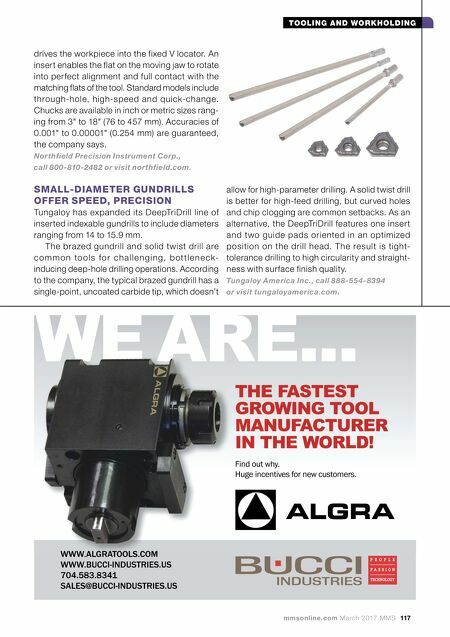 SMALL-DIAMETER GUNDRILLS OFFER SPEED, PRECISION Tungaloy has expanded its DeepTriDrill line of inserted indexable gundrills to include diameters ranging from 14 to 15.9 mm. The brazed gundrill and solid twist drill are c o m m o n to o l s fo r c h a l l e n g i n g, b ot tl e n e c k- inducing deep-hole drilling operations. According to the company, the typical brazed gundrill has a single-point, uncoated carbide tip, which doesn't allow for high-parameter drilling. A solid twist drill is better for high-feed drilling, but curved holes and chip clogging are common setbacks. As an alternative, the DeepTriDrill features one insert and two guide pads oriented in an optimized position on the drill head. The result is tight- tolerance drilling to high circularity and straight- ness with surface finish quality. Tungaloy America Inc., call 888-554-8394 or visit tungaloyamerica.com.